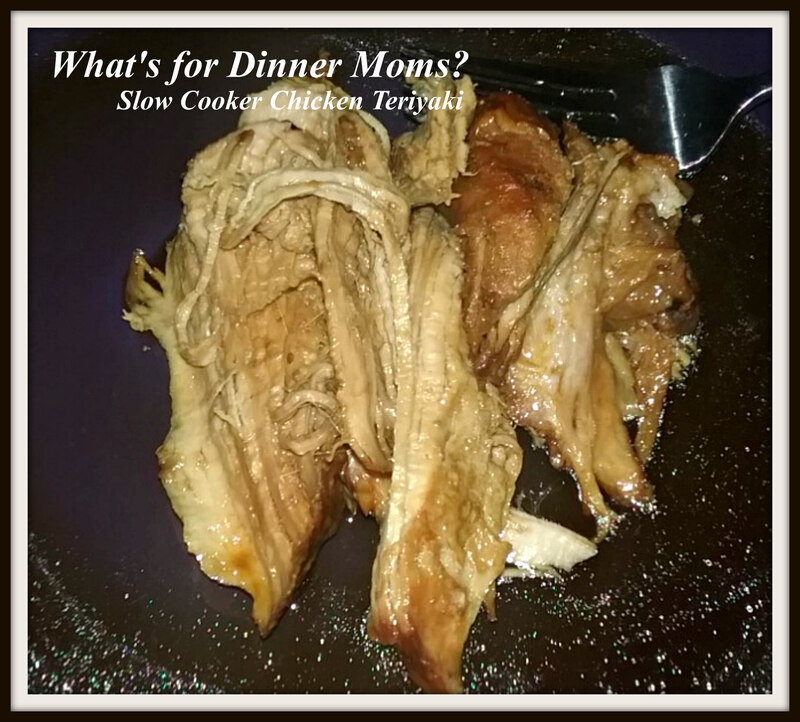 Teriyaki Slow Cooker Pork Loin – What's for Dinner Moms? The picture above says Slow Cooker Chicken Teriyaki, it is not. It is a pork loin. I was thinking about how I could also use this on chicken lost my mind and wrote chicken on the picture. In the meantime I was talking and accidentally erased the original picture so I only have this copy that says chicken. Ugh! But, it is pork and well, they sort of look this same. Teriyaki usually refers to the sauce and the manner of cooking (grilling or broiling) but now most people think of it as just the sauce that gives the meat a deep brown color and a bit of shine from the sugar in the sauce. I used it as the sauce in this recipe and changed the manner of cooking to include my slow cooker because I knew we needed a meal when we got home and wouldn’t have time to prepare a whole pork loin. This worked perfectly for us. As we walked in the house the kids were asking for some of the meat as the house smelled amazing. Add a side of rice or quinoa and a salad and they were ready to go. Both kids had seconds and my daughter asked me to put some pineapple in it next time. Place pork loin at the bottom of the slow cooker. Mix soy sauce, rice wine vinegar, brown sugar, sugar, garlic, and powdered ginger in a small bowl until well blended. Pour over pork loin. Cook on low 7-8 hours until cooked through. To thicken sauce make a slurry of the corn starch and cold water. Stir in a small bowl until the corn starch is completely dissolved. Turn slow cooker onto high and mix slurry into the sauce. Cover and cook on high for 10-15 minutes. Uncover and stir. Taste and adjust spices as necessary. Opened up WordPress Reader and there you are again! Lol! This looks good. I could make this recipe with ingredients I already have. I love the bit of sweetness. Thank you! That is best to make with what you have on hand. I love your honesty! And I’ve been there too – wrong picture, uhg! No one would be the wiser, it still looks yummy. Thank you! It really is pork I just labelled it wrong. Chicken. Pork. Almost the same. I love your slow-cooker recipes. I just need to thaw the meat out in the fridge the night before! Keep on posting. And Happy New Year! The picture is awesome and we can imagine haha. You are a gem! Sure feels like it some days but thank you for being so supportive in all I do! This looks really easy to make and I think I have all of the ingredients. Yum.